Last Friday, Theresa, the kids, and I all headed to the Disneyland Resort to meet up with the Wazny family and celebrate Matt's 40th birthday! They've come to Disneyland to celebrate and to top off a great week at the park, they're staying in the amazing Adventureland Suite inside the Disneyland Hotel! And they invited us to come join them for a birthday celebration! 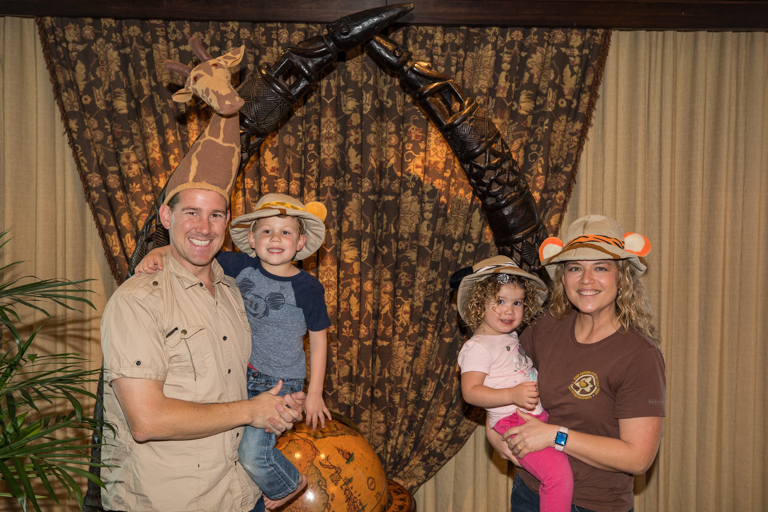 What better hats to wear than our Disney Jungle Cruise helmets. There's Pooh, Mickey, and Tigger. And I didn't know when I'd be able to get my Giraffe hat out, but this seems like a good time. It's an official Disney hat from the Animal Kingdom. And normally, I'd go into a bunch of detail showing the suite and everything it has in it, but in this case, Matt beat me to it. I shared all my photos with him, which he included in his write-up. You can find it all here!